Some context: Stephen Taylor is an enthusiastic dad who happens to be an engineer and loves math. His son Kai also loves math and wants to be an engineer or soccer professional. His daughter is a math and reading wizard, and wants to be a doctor like her mom. Stephen has been teaching his kids math since before they could walk, and holding free and open workshops at their school. He loves watching children’s totally fresh approaches to problem solving. 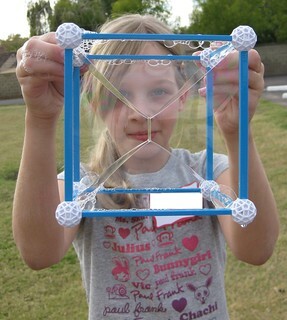 This is Stephen’s story about a series of parent and child Zometool workshops, held at a small school for three hours at a time, and centered on open, gently guided building tasks for small teams. The tasks nurture children’s creativity while introducing ideas of multiple dimensions, shapes and symmetry in nature and around town, and mathematics of beauty.